This clear stamp set is great for Valentine's Day! Images include: Squirrel and bird on a mailbox full of letters, a squirrel hugging an acorn, two squirrels flying on a balloon, a banner with hearts, acorns and sentiments "Hi Valentine!" "Saving all my love for you" "There's nuttin' better than being with you!" "Nuts about you!". Set of 10 clear stamps. Rubber stamps featuring a rabbit, a squirrel, a fox, a duckling, an owl, and a bird. This rubber stamp features a hardwood base with an indexed edge to make the stamp easier to hold and a precisely cut deeply etched rubber design layer that will leave clear, crisp, highly detailed images on most surfaces. 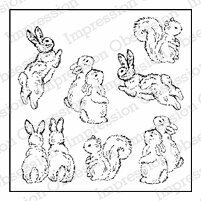 Cling Stamp set from Impression Obsession featuring rabbits and squirrels. 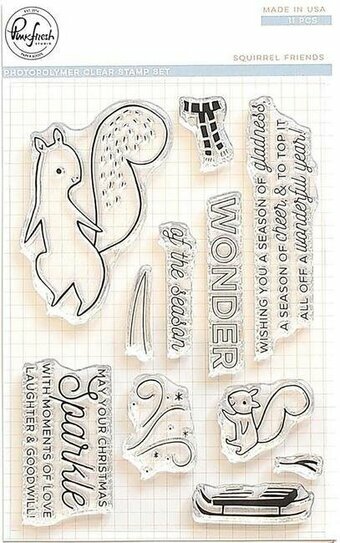 Christmas themed clear stamps featuring squirrels and the sentiments "Wonder of the season", "May your Christmas sparkle with moments of love laughter and goodwill", and more. Adorable furry-tailed friends enjoying time at play are the perfect illustrations to add a light hearted touch to all of your outdoor themed scrapbook layouts and handmade greeting cards! Join in on the fun and frolic at Oakberry Lane as you stamp sweet and charming images of our furry tailed friends at play on tire swings and gathering acorns! Two sweet and charming sentiments round out this adorable assemblage of cling stamps, and are the perfect finishing touch to any paper craft creation! Approximate Image Sizes: 1. Squirrel on Swing: 2.25" x 3.0", 2. Basket Filling Squirrel: 2.0" x 3.5", 3. Acorn Gifting Squirrel: 2.5" x 2.0", 4. Jumping Squirrel: 1.75" x 1.25", 5. A Gift for You Sentiment: 2.0" x .5", 6. Swing by to Say Hello Sentiment: 1.75" x 1.5". Oakberry Lane is a place filled with never ending fun and furry-tailed antics! Join in on the merriment with captivating illustrations of loveable squirrels enjoying the teeter totter, an adorable squirrel displaying it's prized acorn, as well as a large and substantial sized image of the rare blossom native to only the woodlands of Oakberry Lane! When paired with the coordinating dies, these images make charming die cut accents for use in creating your very own playful woodland scene! Approximate Image Sizes: 1. Squirrels on Teeter Totter: 4.25" x 2.25", 2. Squirrel with Acorn: 1.5" x 1.0", 3. Oakberry Lane Blossom: 5.0" x 3.5". Autumn themed clear stamps from Poppystamps and Memory Box featuring squirrels, leaves, a pumpkin, and more. 19 stamps included. 4 x 6 inches stamp set. Ready to give thanks? This charming stamp set is great for fall cards, thank you cards, Thanksgiving cards, or even to thank someone for a dinner party! Coordinating Lawn Cuts: Forest Feast Lawn Cuts. 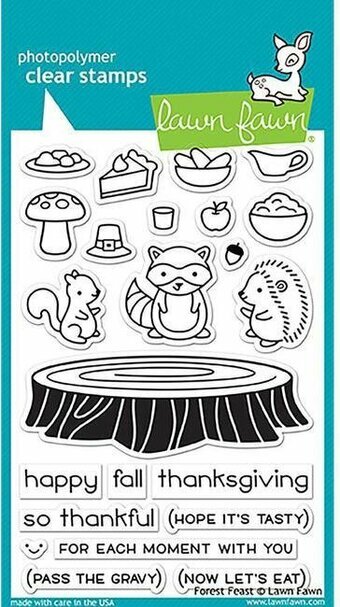 Tree trunk table: 3 5/8" x 1 1/4", mushroom: 3/4" x 7/8", slice of pie: 3/4" x 5/8", apple: 1/3" x 1/3", squirrel: 1" x 1", raccoon: 1 1/8" x 1 1/4", hedgehog: 7/8" x 1 1/8", "so thankful": 1 5/8" x 1/4", "for each moment with you": 3" x 1/8". Make quick work of your woodland-themed cards and projects with this collection of solid creature images. No coloring is required to create a finished look for these classic critters but if you're so inclined, add details with pens, pencils, and embellishments. Use the accent images to complete your scene or spruce up the assortment of included sentiments. This 15 piece set includes: Fox 2" x 1 5/8", Raccoon 2 1/4" x 1 3/4", Squirrel 1 3/8" x 1 1/4", Owl 1 1/8" x 7/8", Bird 5/8" x 5/8", Snail 1/2" x 3/8", Hedgehog 1" x 5/8", Limb 3/4" x 3/8", Mushroom 5/8" x 5/8", Foliage 3/8" x 1/2", Sentiments (5) ranging from 1 7/8" (A Little Snail Mail) to 2 7/8" (I Can't Mask My Excitement) in length. Clear stamp sets include the name of the set on the sticker for easy identification. Our clear stamps and Die-namics are made in the USA. You'll jump for joy with this cute set of critters and fall leaves! This set is perfect for fall crafts, thank you cards, and congratulations cards. Create a fun fall scene with critters leaping into a pile of leaves, or make a simple card with a critter leaping joyfully into the air. Stamp little smiles into the leaves for an extra happy card! Approximate stamp sizes: [hedgehog] 7/8" x 1 1/8", [fox] 1 /12" x 1 1/2", [owl] 1' x 1 1/8", [pile of leaves] 2 1/2" x 2". 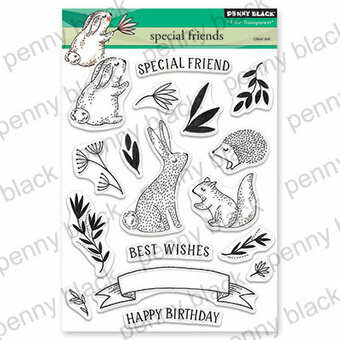 Clear stamps featuring an elephant, a squirrel, a rabbit, a bee, and more. Elizabeth Craft stamps will give an added touch to any paper project.